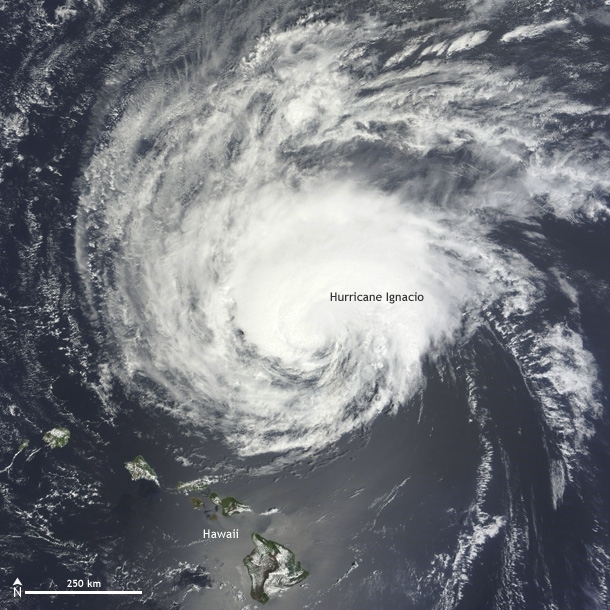 As of August 30, 2015, three separate hurricanes were spinning in the central and Eastern Pacific, all of which were classified as major hurricanes due to their sustained wind speeds in excess of 110 mph. But they aren’t simply garden-variety major hurricanes: each of the three storms were particularly intense, carrying ratings of 4 (wind speeds greater than 130 mph) on the 1-5 Saffir-Simpson hurricane intensity scale. 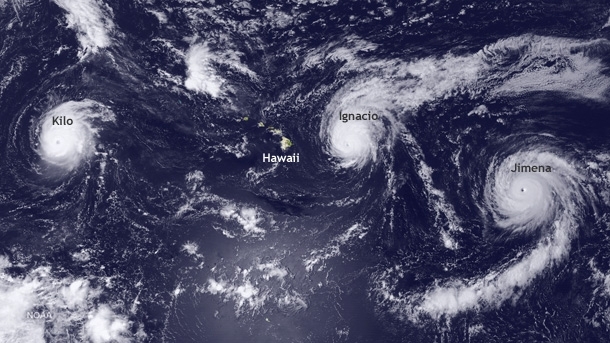 Hurricane Ignacio as seen by satellite on September 1, 2015. Though Hawaii is visible in this image, the storm was moving to the northwest, posing no threat to the islands. NASA satellite image. Hurricanes Kilo, Ignacio, and Jimena appear to be the first three major hurricanes in recorded history to have existed simultaneously in the Pacific Ocean; in fact, Kilo and Ignacio marked the first time that two major hurricanes existed simultaneously. To-date, eleven named storms have been spawned in the Pacific Ocean, with eight hurricanes, six of which have been major hurricanes. On average, three major hurricanes appear in the Pacific Ocean each year. This year’s spike in hurricane activity is tied to a the above-average ocean surface temperatures that are the hallmark of the current El Nino. 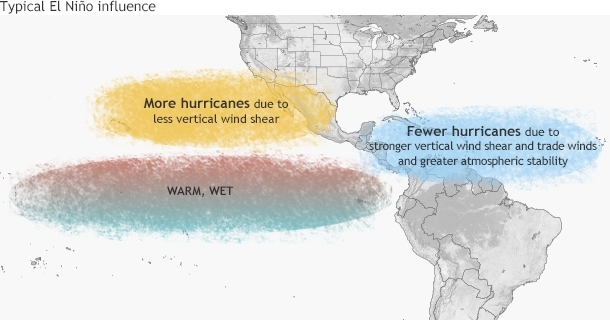 El Nino’s influence has long been connected to increased hurricane development and was a major player in the year’s hurricane season outlook, published by NOAA in May, 2015. El Nino makes the region friendly to the development and strengthening of hurricanes because both vertical wind sheer (harmful to hurricanes) decreases and warm ocean surface temperatures (helpful to hurricanes) become even warmer.